This is review No. 2 of four in the second round of our competition. Each review will compare four burritos, with my favorite advancing to the third and final round. 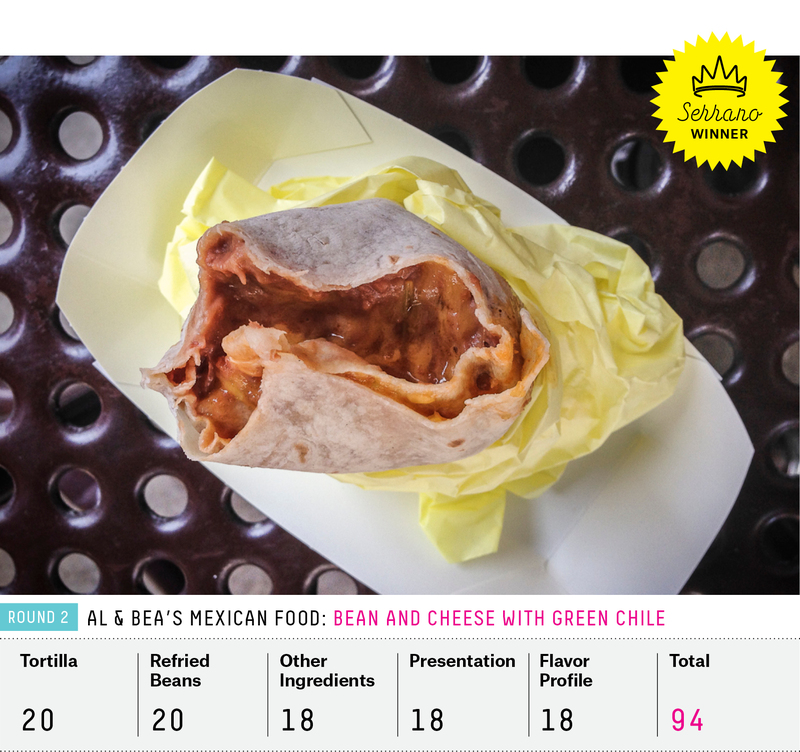 The old-school classic bean and cheese burrito at Al & Bea’s in Los Angeles scored a 96 out of 100 in Round 1 of the Burrito Bracket, beating out several high-scoring LA classics for the win. It entered Round 2 as the favorite in the Serrano quadrant, which includes a burrito from each of our four regions: Bell Street Burritos in the South, Pancho’s in the Northeast and Carolina’s in the West. But while Al & Bea’s had a tough fight in the first round, each of the other three Serrano burritos easily beat its Round 1 competition. Matt Hinton had it all: a wife and two kids and a job he loved, teaching religion at Morehouse and Spelman Colleges. But when the economic crisis hit, enrollment took a dive; he lost a course and the income he needed to make ends meet. And so he did what any logical person would do: He started a burrito delivery service. An Atlanta burrito-selling establishment called Tortillas was once a staple in Hinton’s life. He describes once eating an entire super burrito, a comically large 14-inch tortilla stuffed to nearly bursting, and at the end thinking, “I’ll be less happy if I don’t spend the next 15 minutes eating more of that.” He ordered another and devoured it, too. And then Tortillas closed, leaving a burrito-sized void in the city’s culinary scene. Hinton wasn’t the only one who missed the comforting bundles. When he later launched the delivery service, he quickly built a customer base, selling dozens of burritos once a week. (This, after a disastrous debut in which he burned the beans, had to cook a new batch and showed up to every customer’s house hours late.) It wasn’t until a local food critic called him that he realized his enterprise probably wasn’t legal. So he opened up Bell Street Burritos in the Sweet Auburn Curb Market, just a temporary thing, he told himself. He would keep a light schedule, opening only at lunchtime, and not on weekends. He wanted to spend time with his family. That was in 2009. 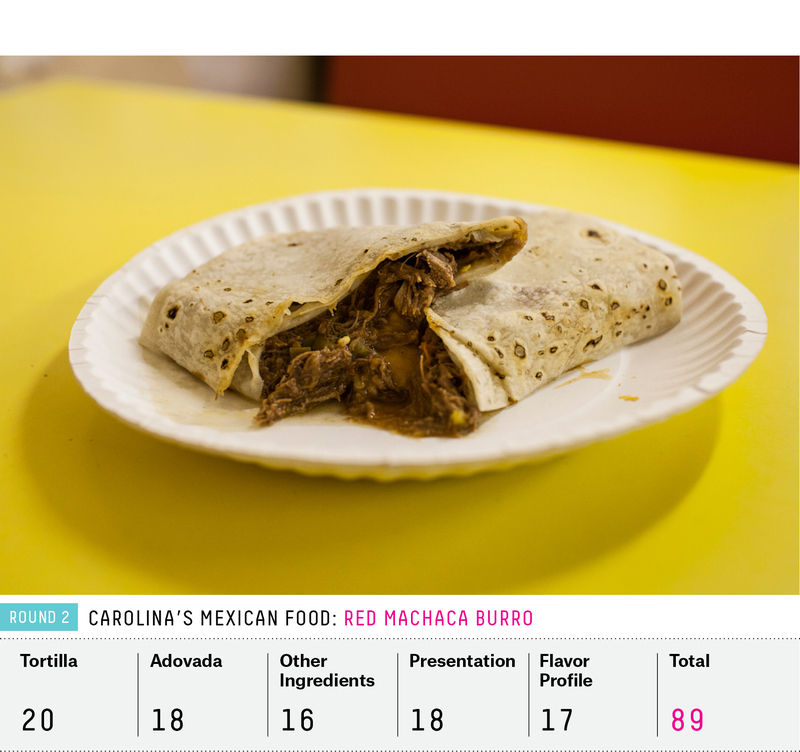 Now, he has a brick-and-mortar store, hopes for another, and has been named on top 10 burrito lists all over the country. Bell Street’s competition in Round 1 wasn’t particularly tough; it faced off against three other southern burritos from Nashville to New Orleans, all with promising components but lacking overall greatness. Bell Street advanced with a thoughtfully assembled burrito, in both choice of ingredients and construction. An odd butter flavor kept the score relatively low, but many things were right about this bundle. Memories of charred green chiles and guacamole had me salivating in preparation for a return. 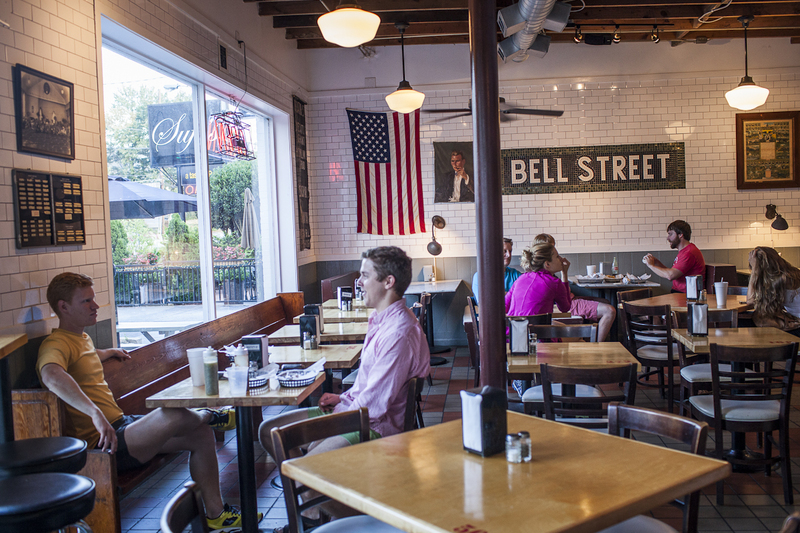 Tucked back from the road at the corner of Peachtree Street and Palisades, behind the overgrown gardens of the Persian and American restaurants next door, Bell Street Burritos’ bright white façade glowed as the sun set over Atlanta on a summer evening. On this second visit, I was joined by Eater’s national restaurant critic, Bill Addison, who moonlights as a member of our Burrito Selection Committee. Between conversations about food photography and recent culinary experiences, Addison told me Atlanta doesn’t seem to appreciate what a seriously good burrito it has on hand. Our burritos (pork and green chile, add guacamole and griddle it please) arrived and I slowly peeled back the tinfoil. I found a tortilla griddled to a dark brown (and greasy enough that I went through a dozen napkins). At the order counter, Addison had reminded me to ask for chipotle salsa, which is only given on request. The smoky, burgundy red salsa paired particularly well with the rice, beans and guacamole, and I carefully added it to every bite. Fleshy strips of green chile peppers were acerbic and slightly bitter from the char. Pork, slow-cooked in a kettle to tender chunks, was cradled by supple pinto beans and rice. But most importantly, the odd butter flavor from my previous trip had completely vanished. The guacamole all landed on the second half of the burrito, forcing me to finish every bite. Addison and I made false promises to ourselves not to finish the whole thing. And yet all that remained were the folds of excess tortilla we’d both removed from our bundles, and a pile of napkins. 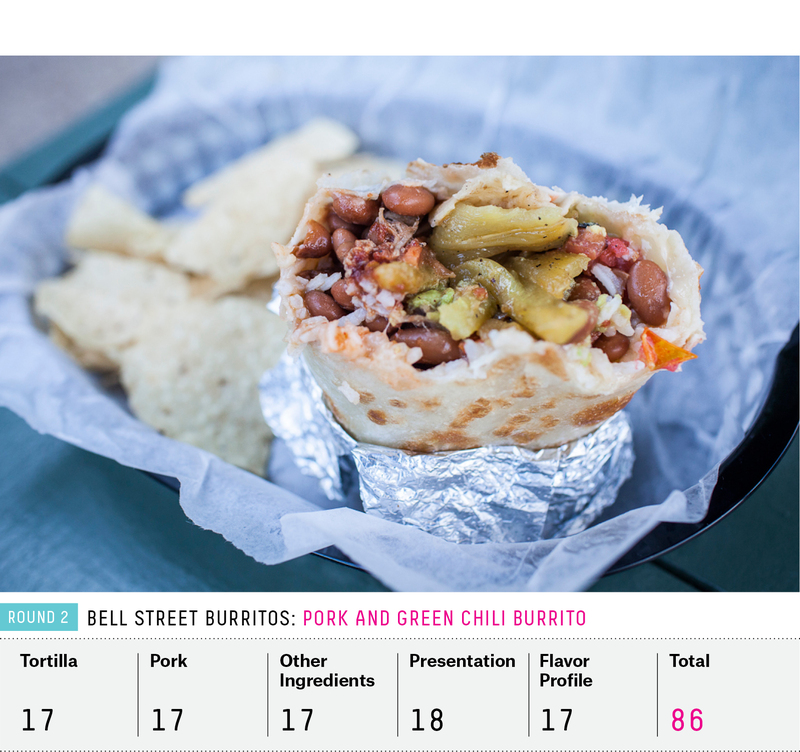 Bell Street is the baby in this group, barely 5 years old, and it doesn’t beat out the wisdom of its elders, but this burrito is going places. The block of East First Street in Boyle Heights just east of Interstate 5 (known just as “the 5”) has the air of a film set, but this is no Hollywood façade. Families wander in and out of a community rec center, artists hang out in front of a studio, a freshly painted evangelical church on the corner announces upcoming activities on the billboard. In a neighborhood known for crime, this block feels like a throwback to a different era, and Al & Bea’s is the epicenter. Though the neighborhood’s demographics have shifted, not much has changed at Al & Bea’s in the subsequent five decades. The founder’s son Ryan Carreon told me that when his mother (Bea) tried to change the tortillas a couple of decades ago, the customers nearly revolted. Save for the addition of an ATM in the corner and a few new tables on the patio, Carreon says the family has preserved the original restaurant. 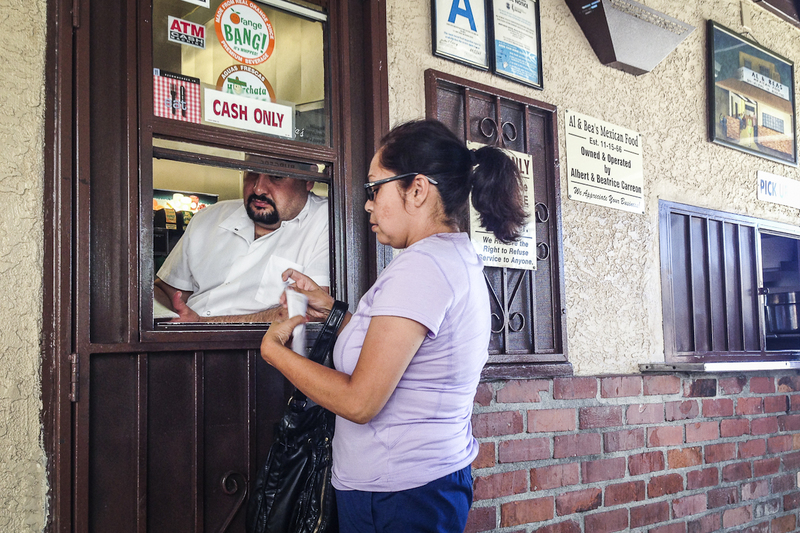 And the Boyle Heights classic continues to draw in crowds with the promise of the familiar and the delicious. On my first visit, I had what I called an “epiphany” when I ate Al & Bea’s bean and cheese burrito with green sauce. I fear it’s impossible to explain what cooking beans for 16 hours on a stove, infusing them with secret spices and a hefty dose of lard, can do to such a humble food. The result is a thick liquid that only barely resembles the original legumes, with a deep, creamy flavor at once earthy and divine. It’s then combined with shreds of sharp orange cheddar and a green chile sauce that’s red in color, with bite and tang. Wrapped together in a floury tortilla made a few blocks away earlier that day, there is mind-blowing depth to the flavor of these few ingredients. This is about as simple as a burrito can get, and yet there is nothing pedestrian about it. In Round 1, Al & Bea’s beat out other classics, the famous Manuel’s El Tepeyac Hollenbeck burrito, Orange County’s favorite breakfast burrito at Athenian III, and the award-winning chile relleno from La Azteca Tortilleria. Knocking out such greats made it a favorite to advance to the finals. But now that it was the sole Angeleno burrito in Round 2, I couldn’t shake the irrational fear that an upset would knock the City of Angels out of the bracket completely. Given that Al & Bea’s has been perfecting their recipes for five decades, it was an unfounded fear — there was no variation in quality between my visits. Just like the first, my second visit produced a tightly wrapped bundle, the size of two packs of tissues, wrapped in yellow wax paper and served in a paper boat. My first bite produced the same giddy sensation of my previous visit: sumptuous simplicity, velvety beans with just the right amount of bite. The ingredients oozed over the edge of the tortilla onto my hands before I could make it halfway through, but I didn’t dare put down the burrito to get a napkin. There’s no halftime with this burrito; nature intended it to be eaten in one go. On a hot summer afternoon in the Ducktown neighborhood of Atlantic City, kids played in the alleys between rows of houses and hanging out on front porches, calling out to one another across busy streets. At the corner of North Mississippi and Arctic Avenues, a sub shop called White House has been a culinary destination for decades. The rundown taqueria next door is easy to miss, save for a cheery sign hanging off the front of the building. But Pancho’s deserves its own place in the food history of this town. I wondered how such a distinctive, delicious Mexican restaurant came to be in the shadow of Atlantic City’s casinos and boardwalk, but several attempts to contact the owner only left me more intrigued. On my first visit I had a run-in with a grumpy cook whom one worker later identified as an owner, but on a follow-up visit I was told that was wrong. Another man said he used to own the place, but now he just worked there. Although the staff is tight-lipped on the restaurant’s history,2 the food can speak for itself. Pancho’s fairly easily won its group in the first round with the novelty of homemade corn tortillas, delicious classic meats and stylish house-made salsa. In truth, everything on the plate was delicious. The service, however, was both odd and erratic, which at first had me wondering whether the food would be as well. When I visited on an early afternoon for Round 2, there were a few glaring differences. Prices had gone up $1 since the previous visit, so the burritos were now $11 each. Pancho’s had also switched from slices of avocado laid atop the rolled burrito to guacamole, which came served in a metal tin straight from the refrigerator and revealed the bright, fresh flavors of onion, cilantro and lime only after it had warmed up a bit. But the rest of the experience was familiar. As with the first visit, a couple of customers lingered over plates with friends, while the majority of the traffic was for takeout orders. Women behind the counter prepared everything from scratch, starting with oversized corn tortillas they pressed out by hand and watched over carefully on a stove dedicated to the golden discs. There was beauty in the discordant textures of gooey mozzarella cheese inside the burrito and salty, crumbly white cheese on top. The carnitas left behind memories of their rich, fat-infused flavor for hours. Tins of salsa, red and green, packed hefty spice into the pulpy contours of fresh tomato, onion and cilantro. 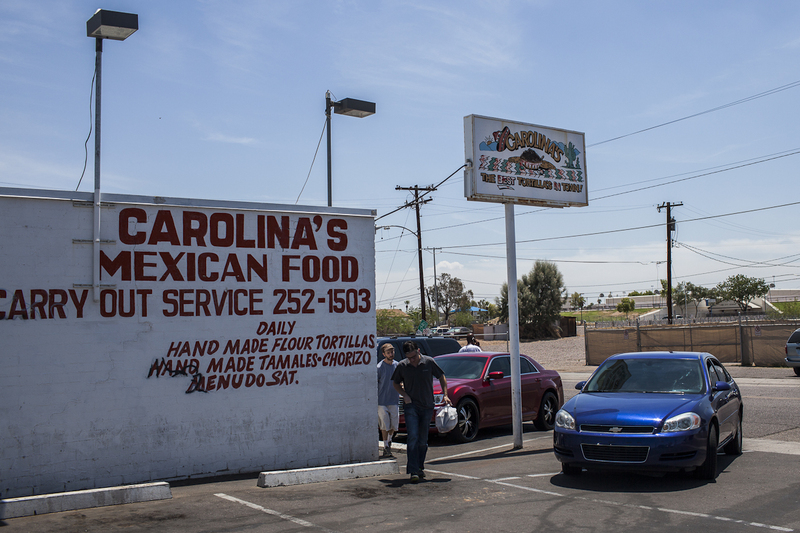 We were deep into a history lesson about Carolina’s Mexican Food in Phoenix. It wasn’t much of an interview. I asked a few questions and Hernandez told me stories about his family and their food, wandering between subjects without prompt. 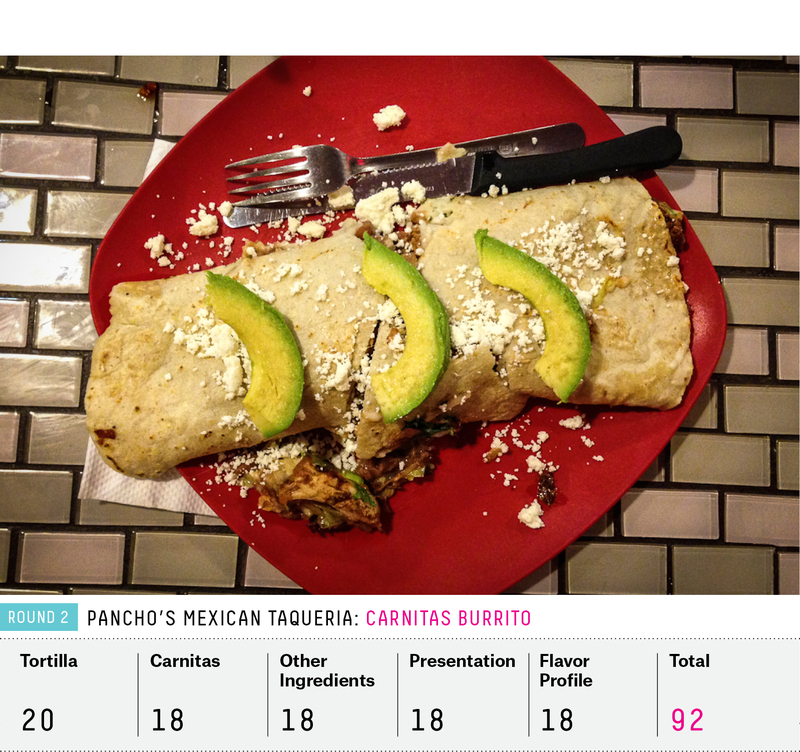 “We sold 685 burros last Saturday!” Were those the most popular food on the menu? “Oh no, that’s the tacos, they probably sell three times as many.” Hernandez has traced his lineage back to 1839 and believes most of the recipes used at Carolina’s go back about that far (“except the green chile, which is always changing a little bit”). Hernandez asked me to guess which burrito was most popular. I said green chile, and he giggled and told me no. Not red machaca or red chile either. “That bean burro has never been beat in any one day of sale,” he told me with delight. When he was a child, his dad had a barber shop and his mom sold burritos out of the family’s brown Chevy. Mom’s name was Carolina Valenzuela. At age 14, Hernandez went to work in the potato fields, where he sold Carolina’s burritos to hungry and appreciative workers. Soon the family opened El Mambo’s Café, which sold Mexican and American food. It was too much work to have two cuisines, so eventually El Mambo’s gave way to all-Mexican Carolina’s. Carolina’s mom worked in the kitchen for bingo money and a ride to the bingo hall. She was the first tortilla-maker. Hernandez’s daughters and their growing families now run Carolina’s. As in the beginning, the family focuses on quick and easy foods, and the crowds are enormous at lunchtime. On my first visit, I’d watched the dozen women behind the counter twisting and twirling masa into impossibly thin tortillas, lightly griddled and sent to the assembly line for someone’s lunch. The red machaca had blown me away with the juicy meat, bitter, deep red chile and flecks of green and cheese to smooth it all out. When I made my second trip, I watched the lineup of construction and office workers instead, in awe of the crowds drawn on a weekday to this old warehouse on the edge of the airport. I took my tray of burros to the dining room, and sat in a yellow booth, seemingly repurposed from an old Subway. The machaca was stringy and earthy. The meat is dehydrated, and then sauced back up with potent red chile, giving the petite, thin burrito enormous flavor. Flecks of green chile provided a touch of heat, while cheese melted and oozed around the burrito. And the skillfully stretched tortillas kept every drop of juice and every fleck of meat tucked neatly inside until I could devour it. Naming a winner between Al & Bea’s and Carolina’s, both old-school classics with simple ingredients perfected over decades, seems a cruel task. But since I have to choose, Al & Bea’s takes the win in this quadrant, with some of the most delicious beans to be found this side of the border. As East Los Angeles was developed throughout the industrial boom of the early 20th century, Boyle Heights was populated by a multicultural mix of “non-Caucasians” (Jews, African Americans, Chinese, Japanese, Mexicans and others), groups that were excluded from the housing markets elsewhere in town. A more detailed history can be found here, while a timeline of migration to the neighborhood is here. 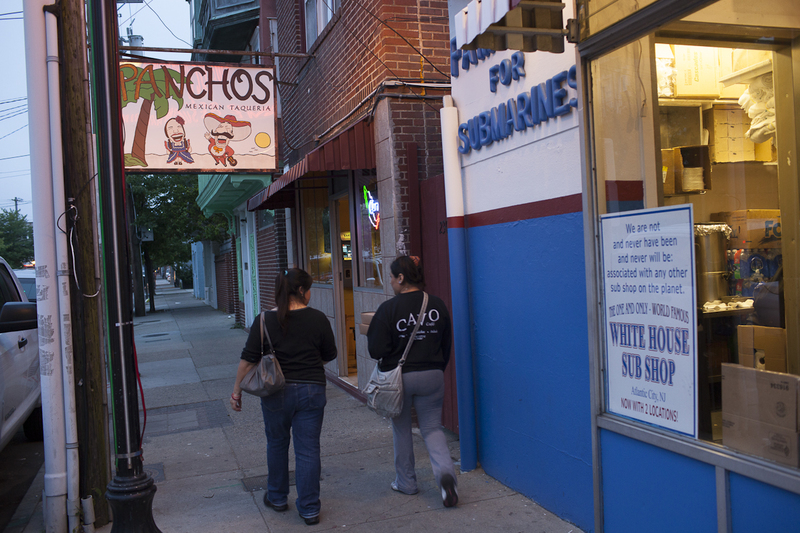 According to Atlantic City’s licensing and inspection department, Pancho’s is owned by Albar Sanchez.